When I was a child living in Prague, my aunt Vera, (the artist), used to tell me a lot things people might consider nonsense. But it was the most beautiful, romantic magic to me, and now that I’m, you know, like an adult and hold two degrees, it’s still wonderful stuff that I hang on to even if I should know better. For example, I remember walking hand in hand with my aunt in a park in Vienna and watching a crow ripping up a paper bag. “Why is that crow ripping up the paper bag?” I asked my aunt. “He’s angry.” she said. “Why is he angry?” “Because it’s so cold.” said my aunt. And I’ll tell you what, a little, tiny part of me still believes that crows get angry when the weather gets cold. Like her, I like to wash my face in the early morning dew. Apparently it keeps the wrinkles away, and I still say, “good morning Mr Magpie” to the first magpie of the day that I see. Actually, then I tend to look for the second one just to be on the safe side…you know, one for sorrow, two for joy… anyway, thanks to my aunt, who the whole family, (scientists, doctors), described as having no common sense while I thought she was the most brilliant one of us all… I like to think that starlings who sit on lines and flock together in murmurations are in training for a long flight to southern climates. Artist…eh? Of course, I’m all grown up like an adult now, and know that starlings fly in murmurations has much more to do with a primeval response for shared vigilance, and especially in late autumn when breeding is over, and maybe once breeding is over they have nothing better to do, but part of me wants to see it as a great Olympic style training for the long and arduous flight south. They need to escape the snow, and in that way, they are my choice for this liminal space. To me, they best represent the threshold into winter. I like magic so much more than common sense. 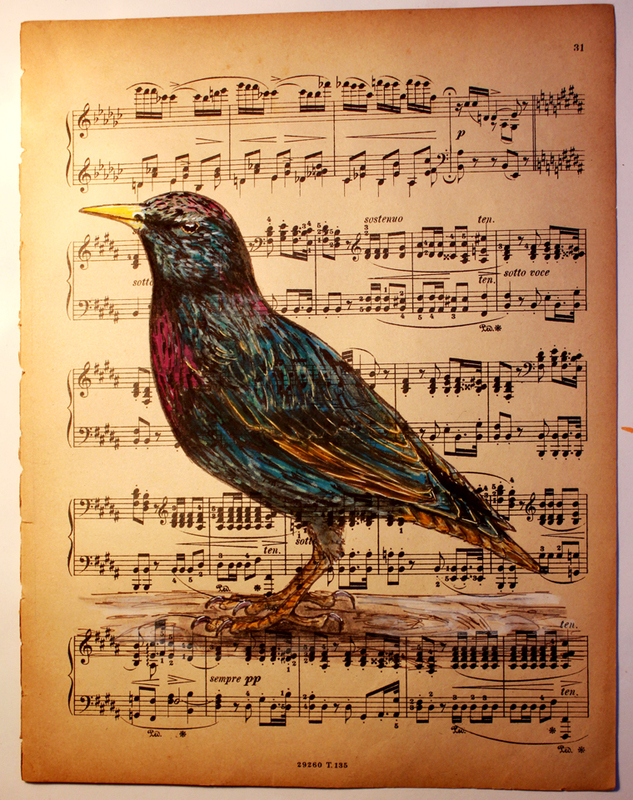 Art: Starling painted on a Chopin piece with the word “sostenuo” sustained, and sotto voce, so as not to be overheard. That’s magic for you, always there, silent. Painted with black ink, white ink, and watercolours. That is one of the reasons I don’t particularly like science. I’d much rather stare at a rainbow and be amazed at how beautiful it is, thinking I am seeing a small miracle, than have someone explain to me how the rainbow is just a reflection of water particles in the air or whatever it is. Life needs a little magic! I am blown away with this post. I love the magic of the flocks of birds, wafting on the air. I am always ready to believe in magic – it is just more fun that way. What is life without some magic in it? Feh. I also enjoyed your tales of your aunt. thank you. i’ve always wondered if the birds ever know they are offering us such spectacle… i mean, there’s almost got to be a meaning to it, right? great, great vid. other-worldly. like a giant whale (and other animals) moving gracefully up in that great span of sky… natural patterns, he? hey, i hope you may always and forever keep the magic within and throughout… i agree it to be most important. thank you for this exquisite theme, it did hold me bemused all week long, i started out a long post and settled for limited words in the end. thxs, n? Wonderful to have a aunt like this. We should try to retain something like this for every day. Or listen to our children – they will tell us. Thank you for this inspirating them this week dear veronica. I love the murmurations of birds -they are mesmerizing and magical, and a perfect interpretation of liminal. I finally posted mine; sorry that it’s a bit late. I so like that comment of yours V .. Magic is so much more exciting. That video is just beautiful .. Thank you for sharing. What a wonderful post ?